Large format screens are everywhere, from the boardroom to your living room. A smudged, dirty screen can ruin the image of your presentation in that important meeting, or limit your viewing pleasure while watching the latest movie release at home. What's the point of HDTV if the screen is filthy? A smudge can cause you to miss the big play or the highlight of your child's first steps. The Premium Screen Cleaner Kit from Dust-Off® gives a safe and thorough cleaning with its two-part system of spray and cloth. The screen spray features an exclusive no-run formula* that can be sprayed directly on the screen. While other cloths can leave smudges and lint behind, the Dust Off microfibre cloth leaves nothing but a smooth, clear picture. Desktop computers are a staple in our offices and homes. 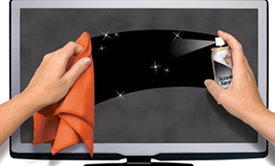 Keeping the screen clean is necessary for both work and enjoyment. A dirty, smudged screen can make it difficult to understand the figures from this month's reports or ruin your view of a Youtube video. A filthy screen can hurt your eyes and can make computer games unplayable. Dust-Off has four products to wipe out dirt, lint and finger oils starting with pre-moistened Monitor Wipes in two sizes of convenient tubs. For more thorough cleaning, use the two-part Premium Screen Cleaner... complete with the exclusive no-run spray* and safe microfibre cloth that leaves no residue. Also available is our Office Share Pack of Monitor Wipes packets, perfect for display in common areas of your office for all to use.